Kit requires painting. Available in Standard and Premium finish. Requires painting. Available in Standard and Premium finish. Available as a kit or ready made. Kit requires finishing and painting. Kit does not include mirror face (use covering or aluminum foil to imitate mirror face). 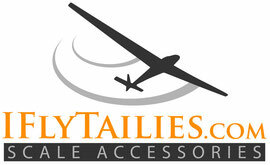 All IFlyTailies content copyright by IFlyTailies except where otherwise indicated.